North West professional musical director, pianist and keyboard player Craig Smith is one of the most sought-after session musicians the region. He has hundreds of gigs under his belt with live bands and singers, with his CV including work for/with artists such as Bryan Adams, Paloma Faith, Pixie Lott, Tinchy Stryder and many more. Craig has worked as musical director or musical supervisor on several theatre productions, is a regular performer with various originals bands and function bands in Manchester, Liverpool and elsewhere, and is available as a 'dep' keyboard player nationwide, covering at short notice for ill or injured musicians. Craig's equipment includes top spec Nord and Roland pianos, synthesisers and workstations, a Macbook Pro based Logic for running audio, clicks etc, and an in-ear monitoring system. His instruments feature some of the very best piano, Hammond organ, Wurly, Fender Rhodes and other electric piano sounds available. His synth gear offers literally thousands of patches from classic analogue sounds to modern electro ones, and some very authentic orchestral and horn sounds too. Craig is full-time keyboard player with popular Merseyside five-piece pop-rock band Jessicas Ghost, who play regularly in Liverpool, Manchester and Cheshire. He also plays keys with various function bands. Demos of Craig's live band work can be heard via his Soundcloud. Craig has recently worked as musical director, musical supervisor, producer (or a combination of the three) for the live shows of the Opera Boys UK Tour, and producer / musical supervisor for the international theatre show Simply70s: Ultimate Classic Rock, The Gary Barlow Live Tribute and various musical theatre productions. He has worked within the bands for numerous other shows as a regular or dep session musician. 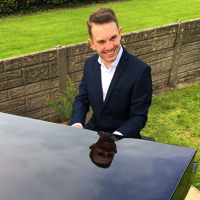 Craig is a popular choice as a restaurant, hotel and corporate pianist in Lancashire, Cheshire, Liverpool, Manchester and the Lake district. He plays all styles from classical to modern chart music. Please visit our Weddings pages for wedding details. Craig is available as a recording session musician for producers, singers and bands. Most recording takes place remotely from Craig's own project studio, with full audio files being sent electronically following approval of an mp3 sample. This method is a lot cheaper than booking Craig to travel to the studio, saving studio time, travel expenses and possible accommodation costs too, and also meaning Craig can record in his own time between other jobs, so the price needn't be as high. Piano, EPs, organs, synths etc are all covered, as is drum and other programming. Craig's highest profile recording sessions to date were working in Manchester playing keyboards on a forthcoming Bryan Adams album. In addition to his regular bands, Craig plays as a dep or session musician with several other function bands, some of whom are amongst the UK's elite. His training at Sir Paul McCartney's Liverpool Institute for Performing Arts (LIPA) was largely popular music performance based, focusing on ensemble playing and playing by ear, with tuition from top session musicians and artists. Craig can pick up two sets of music in a few hours, so is easily able to slot in to any band who's keyboard player falls ill or leaves at short notice. All that is required is an accurate set list with keys, and either charts or structurally correct recordings (YouTube is great for this), and Craig will have the set down in no time. The majority of function bands' songs are already in Craig's repertoire anyway. Usually, Craig's dep gigs are without rehearsal, but there's no problem having a pre-gig rehearsal for the other band members' peace of mind. Craig is also a solid live sight reader of both dots and charts. Craig has filled in for periods of time with several top UK function bands and corporate entertainers who've lost their keyboard player but didn't want to tell agencies, clients etc that they were a member down. Discretion in these matters is guaranteed; there is no reason to concern your clients when you lose a keys player with their wedding next week! Craig works as a full time musician, playing piano, guitar and providing backing vocals. He is an experienced accompanist following several years working as a theatre musical director. Craig is available to accompany singers in duos for restaurants, hotels etc. His comprehensive list of session musician contacts, and experience as an MD and arranger, mean he is also able to quickly put together a quality backing band for singers (usually looking to showcase studio recordings live) with relatively little rehearsal time and expense.